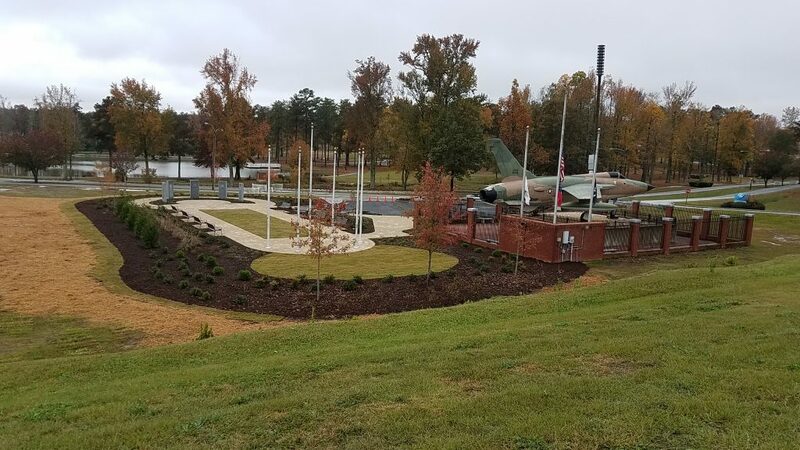 The Douglasville Military Honor Garden at Hunter Park opened Veterans Day Nov 11, 2017 with a dedication ceremony. It all began with the desire to honor one of Douglas County’s fallen soldiers Staff Sgt. Joshua Bowden with a tree planting. That desire inspired a garden to honor the men and women that serve our country in the five branches of the United State military. Army, Navy, Marines, Air Force, and Coast Guard are all represented in the garden with Georgia Granite monuments and service branch flags raised high. 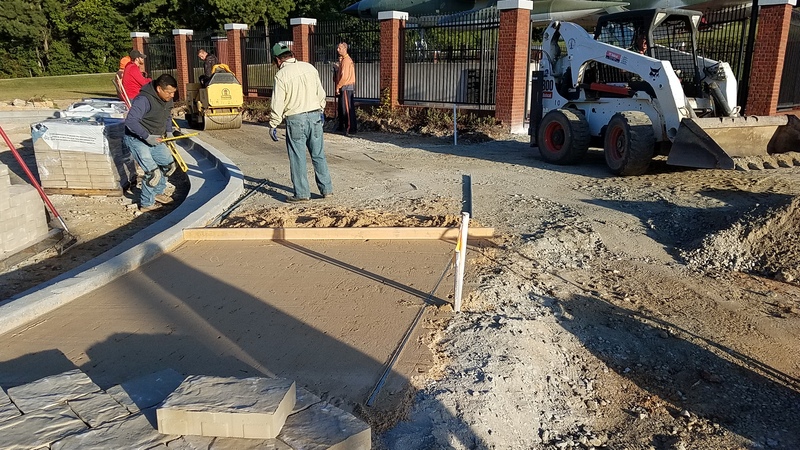 Keep Douglasville Beautiful Board led by Executive Director Chan Weeks developed the concept for the Douglasville Military Honor Garden. Board Chairman Paul Laseter, ASLA communicated those ideas on paper to begin casting the vision to the community. The community enthusiastically jumped to support the project with money and in kind gifts. 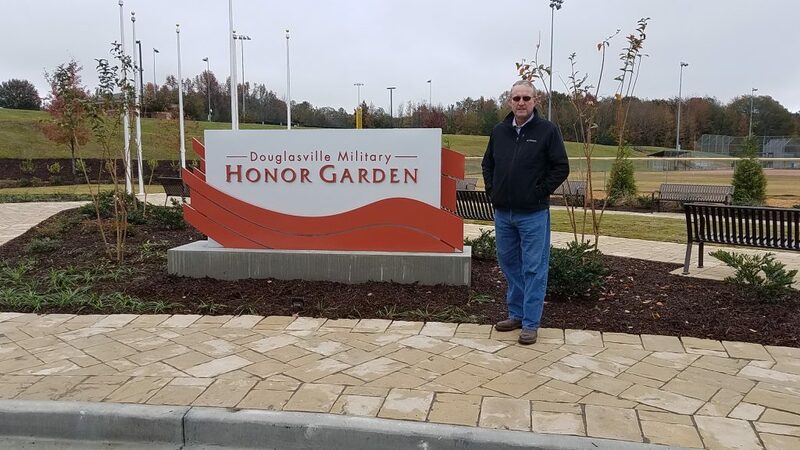 Craig McManus the project manager and designer for Douglasville’s Freedom Island project was asked to serve in the same capacity for the Douglasville Military Honor Garden. Craig refined and fleshed out the concept drawing to the gardens you see today. 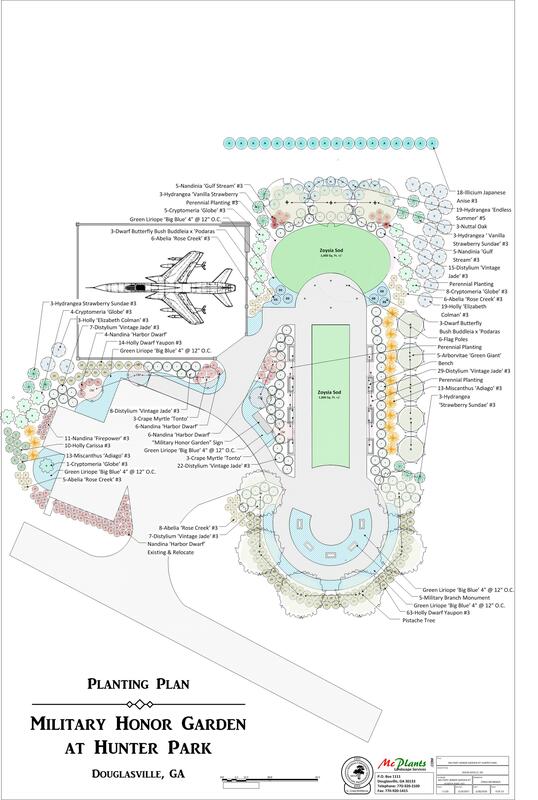 Some notable additions are the plant design, flag plaza, and Belgard Mega-Lafitt pavers. He also daily managed the project’s construction which included over 100 workers and volunteers involved in the project. McManus is the principal at McPlants,inc. He has lived in the community with his family for over 50 years. 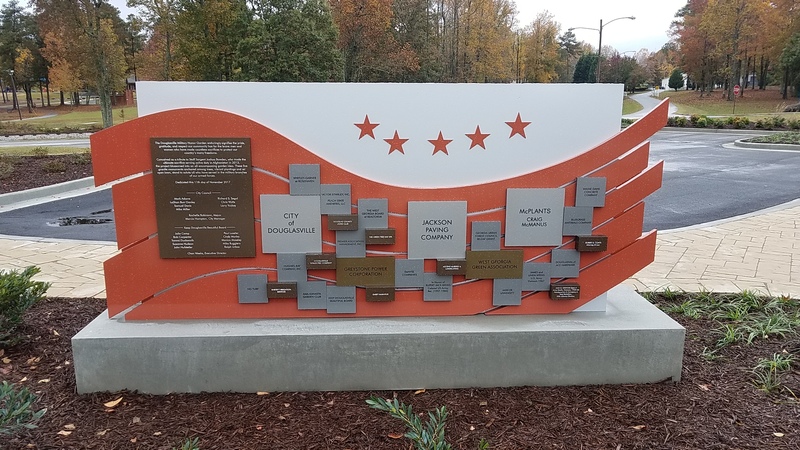 The new Douglasville Military Honor Garden is constructed to the east and south of the existing Veterans Memorial which was built in 1998. The Veterans Memorial is the home to a F105-D Thunderchief jet. It represents the plane Lt. Robert G. Hunter was piloting when he became the first Douglas County casualty of the Vietnam War. 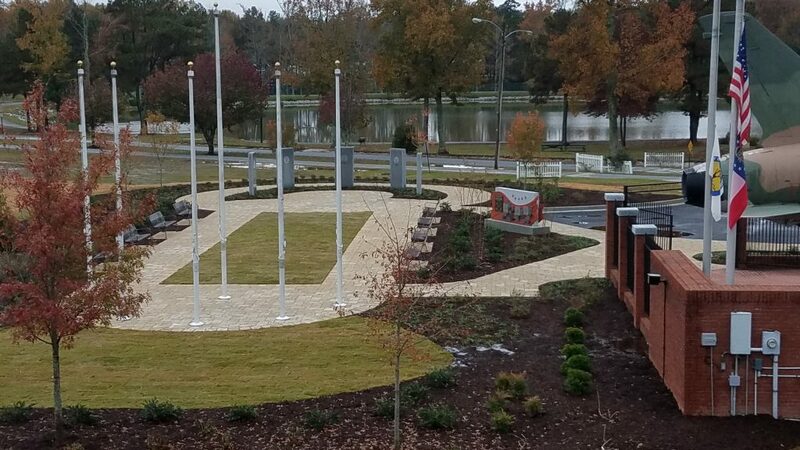 Southern view overlooking the new Douglasville Military Honor Garden. Joshua’s Tree which inspired the garden is the tallest fullest red leaf tree on left. It is the center tree of three Nuttal Oaks anchoring the north end of the garden. 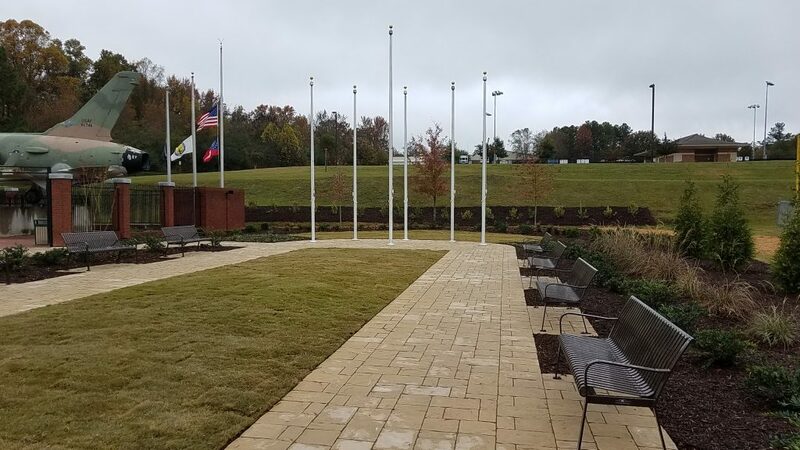 Southern overlooking view of Douglasville’s new Military Honor Garden construct to the east and south of the existing Lt. Robert G. Hunter Veterans Memorial built in 1998. The F105-D Thunderchief represents the plane Hunter was piloting when he became the first Douglas County casualty of the Vietnam War. 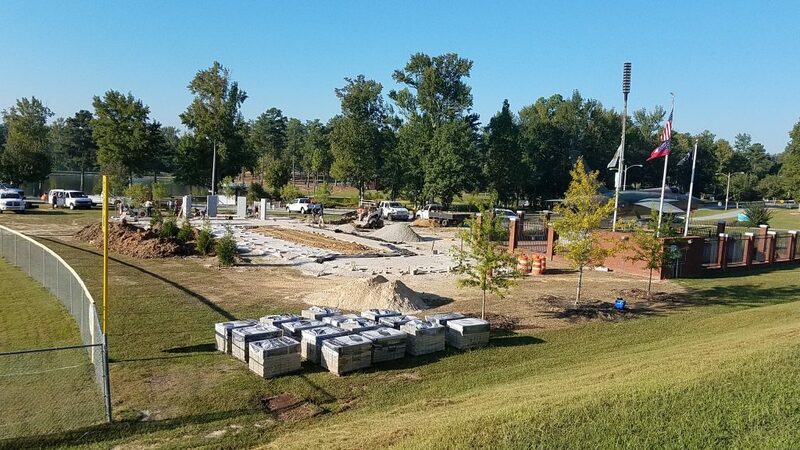 Northern ground level view of the new Douglasville Military Honor Garden. Six flag poles stand waiting in the plaza. The next day we will see the United States flag and five military service branch flags raised for the first time over the garden. Eight VictorStandley benches and Belgard Mega-Lafitt pavers line the Marvel II Zoysia grassed mall between the flag plaza and monument plaza. Southern ground level view of the Douglasville Military Honor Garden. Five Georgia Granite monuments stand with each representing a military service branch. 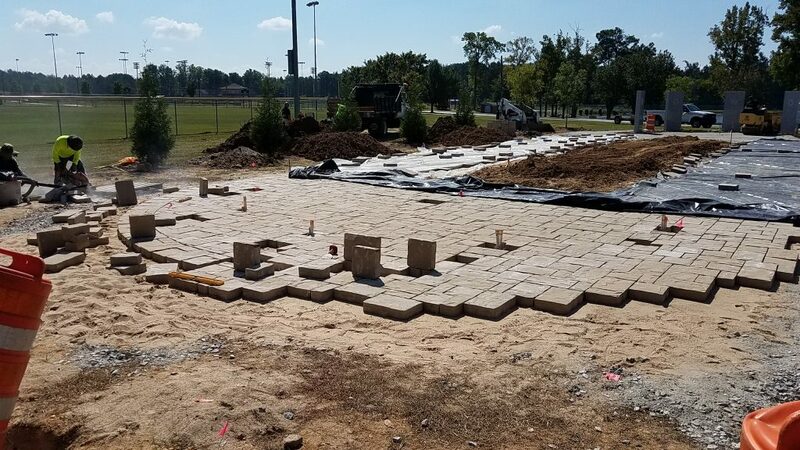 Belgard Mega-Lafitt paver circular walk form the perimeter of the monument plaza at the Douglasville’s Military Honor Garden. Five Georgia Granite monuments represent a military service branch. Donor Support Wall at Douglasville Military Honor Garden. 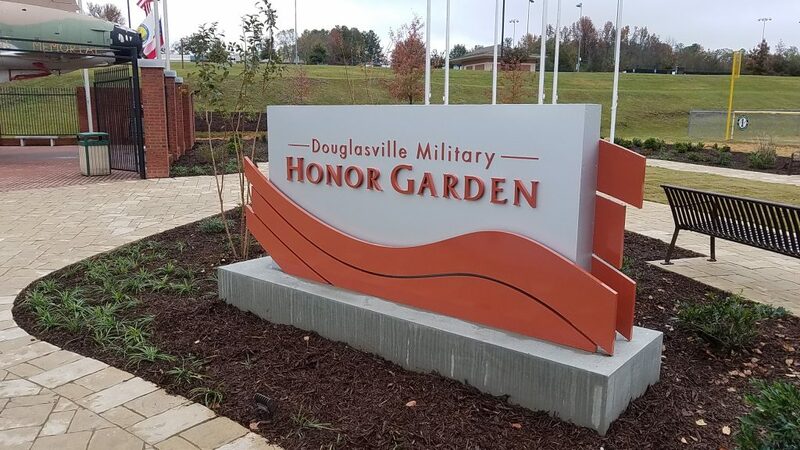 The Douglasville Military Honor Garden enduringly signifies the pride, gratitude, and respect our community has for the brave men and women who have made countless sacrifices to protect our country’s many freedoms. Conceived as a tribute to Staff Sargent Joshua Bowden, who made the ultimate sacrifice serving active duty in Afghanistan in 2013. The project blossomed into an all-encompassing garden idea. These five granite monuments anchored among trees, vibrant plantings and an open lawn, stand to salute all who have served in the military branches of our armed forces. 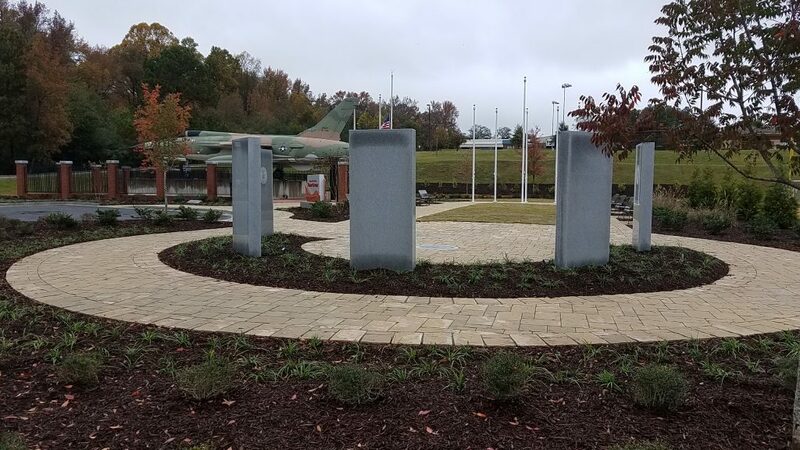 Southern ground level view of the Douglasville Military Honor Garden monument plaza. 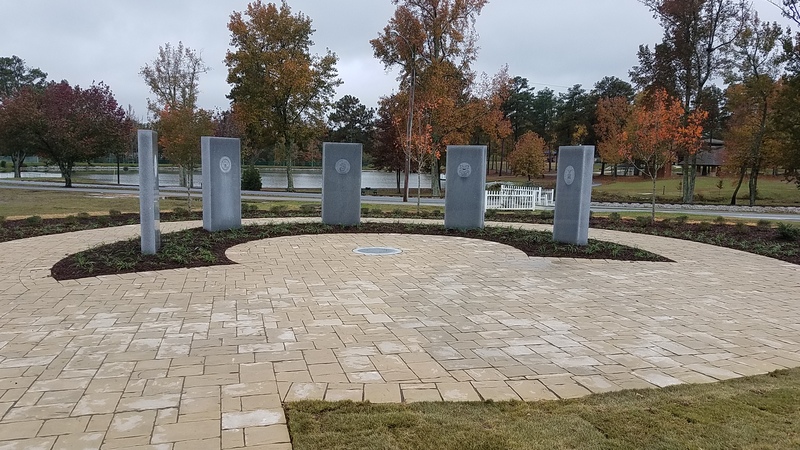 Each military service branch is represented with their official seal engraved on a Georgia Granite monument. In the center of the monument plaza a Laurel Wreath is carved into a circular Georgia Granite medallion. Douglasville Military Honor Garden Laurel Wreath carved in a circular Georgia Granite medallion. It is the center point of the the monument plaza. The medallion is set among the Belgard Mega-Lafitt pavers. A Laurel Wreath is a symbol of victory and honor. 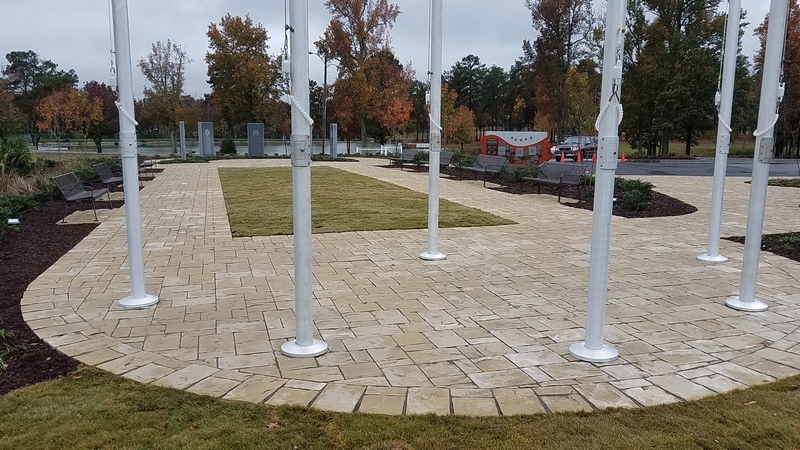 Belgard Mega-Lafitt pavers anchor the flag plaza in the Douglasville Military Honor Garden. Each one of the perimeter’s five flags represent a military serve branch with the United States flag pole at the center of flag plaza. 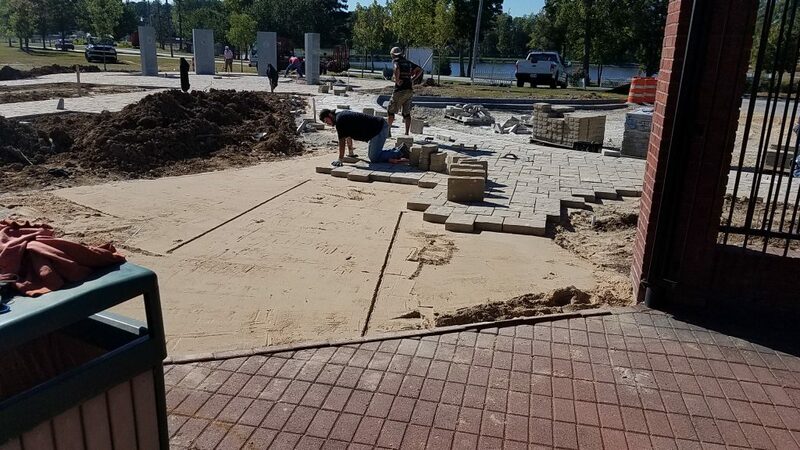 Connecting the Military Honor Garden with the existing Veterans Memorial. Belgard Mega-Lafitt pavers place on a 6″+ compacted aggregate base along with 1″ secreted sand. 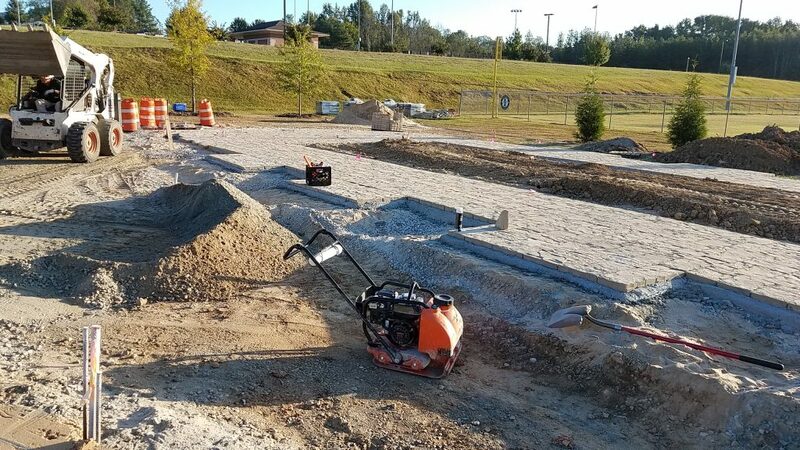 Military Honor Garden construction in process. Over 100 tons of material in the walks alone. Installing the Belgard Mega-Lafitt paver walk around the new parking lot curb. Notice the new Georgia Granite column caps added to the existing red brick columns of the Veterans Memorial (jet area). 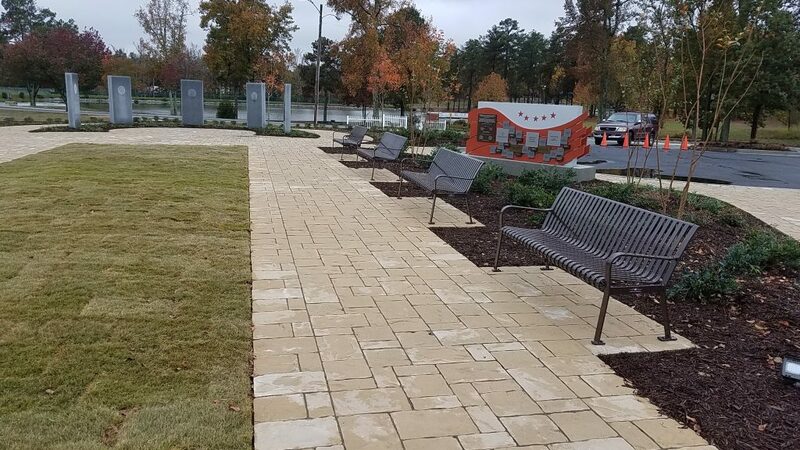 These Georgia Granite cap accents visually tie together the new Douglasville Military Honor Garden with the existing Veterans Memorial. Preparing planting bed area for top soil installation by removing aggregate. 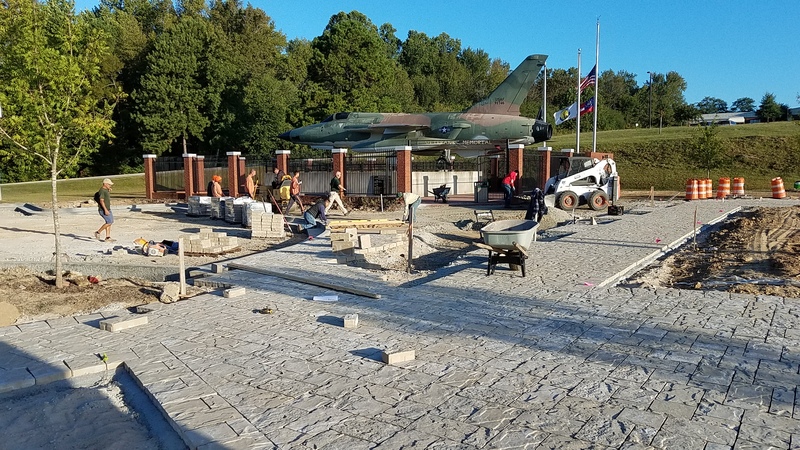 The Belgard Mega-Laffit pavers are install on 6″+ compacted aggregate with a 1″ sand base in the Douglasville Military Honor Garden. Belgard Mega-Laffit pavers are installed on 6″+ compacted aggregate with a 1″ sand base along the new parking area curb in the Douglasville Military Honor Garden. 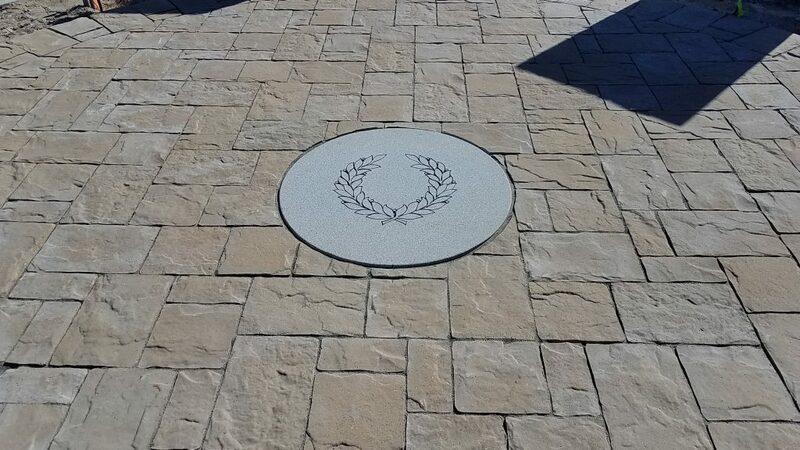 The pattern cut out of Belgard Mega-Laffit pavers is ready to receive the Georgia Granite Laurel Wreath medallion at the center of the monument plaza. 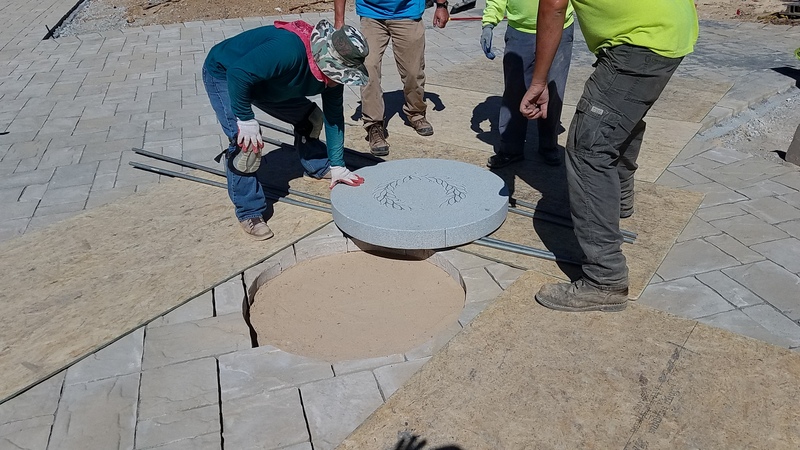 The Douglasville Military Honor Garden medallion is rolled into place over pipe using a technique perfected in Egyptian pyramid construction.